Last night, I put the finishing touches to AirMusic and submitted to Apple for review. I am hopeful they will not reject it because it’s damn cool ;-). After a first rejection due to a mistake on my end with anti-crack protection, I resubmitted and it’s now back in review. Waiting game now. And it’s now live on iTunes! – Added iPhone 4th Gen & iPad device shell. – Automatic proper device selection upon connection (can also be manually set via menu). – Device can now be rotated in all directions, by 90° increments, via menu or command+left/right keys. – Shell can now be resized or stretched so iPad or iPhone 4 can fit on smaller screen resolutions. – Can now enter device IP manually for when network topology prevents Bonjour from working. – USB now working with Display Recorder. – Added support for iPod 4th Gen. In preparation for our iDemo app to be approved by Apple, we just released a new version of iDemo. This includes USB support so you will be able to plug your iDevice with a USB cable into your computer and iDemo will connect to it with a much faster framerate. And this feature is available for Mac (even 10.5 ppc) & Windows from the get go! This version also includes support for the latest ScreenSplitr with iOS4 support that we hear is coming out today. iDemo in the AppStore soon? Last Friday, we submitted iDemo for iPhone iOS4 to the AppStore. 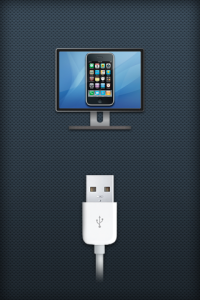 iDemo app uses the background/multitasking feature of iOS4 to send your iPhone screen to iDemo. We’ve been working hard on this feature so we really hope that Apple will approve it. We can’t wait to show you. We just all have to be a bit more patient now. We’ve been working hard at fixing bugs and crashes related to Windows 7 64 bits version. We plan to release an update by tomorrow. Additionally, we’re making some progress (on Mac OSX at least) with USB support. Soon you will be able to connect to your iDevice via USB directly, not requiring a WiFi network anymore (Infrastructure or Ad-Hoc). Some R&D work has also been done on supporting iOS 4. We think we can eventually release it on the AppStore and hope Apple will see its benefit and approve it. But that is for another post.